Polished diamond prices declined in March in the Israeli diamond center, softening by 0.8%, according to the GDX diamond index. The declines during March were followed by mixed pricing activity during the past week. Wholesale polished diamond prices were overall flat in Israel during the past week, after a period of softening prices during the last ten days of March. The GDX index closed the week at 0.0% compared to the prior week. Activity in the Israeli diamond center was characterized by limited and subdued activity during the past week as many Israeli traders were away on vacation during the Passover holiday. 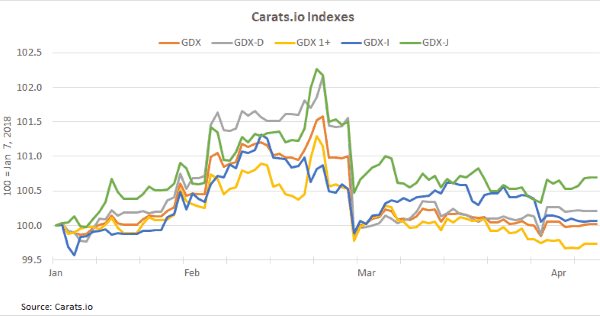 GDX, Carats.io’s general index, averaged 10,000.87 during the 14th week of the year (April 1-7). The index represents the most tradable diamonds in the Israeli diamond market. The GDX index opened the week at 10,005.87 and closed at 10,002.27. The largest declines were among the higher-end goods, as reflected in the GDX-I index, which includes the top color and clarity diamonds. GDX-I declined 0.21% compared to the prior week. Another area where prices declined was the larger goods. GDX-1+ lost 0.11% compared to the prior week. Together the two indicate a decline in demand for higher cost round polished diamonds. Prices did rise for smaller goods and for lower quality items, during the past week. Polished diamonds typically used for jewelry in the American market, as reflected in the GDX-J index, rose 0.13%, while the GDX-D index of smaller goods increased 0.10%. Although polished diamond prices in Israel increased during the first few day of the month, Carats.io’s third month of indexed pricing, asking prices of polished diamonds softened throughout most of the month. The decline was a seasonal one. Usually wholesale polished diamond prices rise during January and February as retailers, mainly in the US, stock up on goods. The restocking fuels price increases, and at the tail end of February, prices often rise ahead of the gem trade fair in Hong Kong. Prices typically decline after the show, with nothing to push up demand until May, when Mother’s Day is celebrated in the US. This year, as the results of the Hong Kong show did not meet trader expectations, prices were further pressured downwards. During March, the GDX index declined by 0.83% to 10,100, erasing the February gains. GDX-D fell 1.22% to 4,005, also eliminating the February price increases. Despite their weakness in the past week, GDX-I and GDX1+ suffered from the smallest price declines.